Very often, I am asked this question by ecommerce store owners, “Why should I focus on influencer marketing for ecommerce, when I could spend money on SEO, PPC and online ads for my store?” This is indeed a valid question. After all, the methods mentioned above are all direct ways to promote your store. Well, let me answer this one with a question. When you’re thinking of buying a new gadget say, a smartphone or a laptop, what’s your first step? Do you visit the website of tech-giants like Apple or Samsung? Or do you check out YouTube video reviews or other review sites to get an idea of the popular products on the market and how they compare? Now, you’ve got the answer to your earlier question. In today’s social media age, peer recommendations from social media celebrities, aka influencers, are what drives us to make a purchase – be it an item worth ten dollars or a few thousand dollars. Today’s consumers no longer trust brands that use celebrities to promote their products. They are wary of such advertisements. They know that the celebrity is endorsing the product only on a commercial basis, and that’s no reason for them to make a purchase. Instead, social media celebrities, aka influencers, are the people who are driving sales, by recommending products and getting people to open their wallets. If you’re new to the game of influencer marketing, then don’t forget to download our free email influencer outreach templates that give you the best ways to approach influencers for promoting your ecommerce store. If you’re familiar with influencer marketing, we’ve got something for you too. Check out our guide on repurposing user-generated content. Influencers give you instant access to an enormous audience that you wouldn’t be able to reach with traditional marketing methods. The best part is that influencer marketing isn’t like shooting in the dark, hoping for the best. Instead, influencer marketing, when done the right way, is a highly-focused method that helps you target, reach, and convert your niche audience. The followers of each influencer perceive influencers as persons of authority in their niches and are likely to listen to and act on recommendations from them. So when you get the right influencer to endorse your product, you can potentially double, triple, or even 10x your ecommerce sales. With that said, not many businesses know where to start. They consider influencer marketing just another digital marketing method and fail to grasp the key elements that are essential for the success of influencer marketing. If that sounds like you, buckle up and get ready as I share with you the rules for attaining success in influencer marketing for ecommerce. This guide is jargon-free, easy to implement, and loaded with examples to help you get started. Influencers come in a variety of sizes and shapes. There are YouTubers, bloggers, Instagram celebrities, product reviewers, and more. And there are also influencers of many different sizes. Here, size refers to the popularity of the influencer on social media. And you should know that, when it comes to influencers, bigger isn’t always better. According to a recent study by Experticity, a whopping 82% of people reported that they are likely to trust a recommendation from a micro-influencer. Micro-influencers generally have between 1,000-10,000 followers. At first glance, follower count may appear to be a major defining factor in influencer marketing for ecommerce. But, as you dig in deeper, you find that engagement rates are what matter more. Don’t be tempted to bring a celebrity influencer on board, just because they have a wider reach. Instead, look for influencers who have a niche audience, and who enjoy better rapport (and engagement rate) with their fan base. It may be tempting to choose the influencer who charges you the least or who is readily available. But that can lead to a fatal mistake, one that could damage the reputation of your online store. You need to look for niche influencers who are a perfect match for your brand. You may come across a thousand influencers, but find that only a handful suit your brand’s values and persona. And that’s ok.
A highly relevant team of 5 influencers is better than 50 influencers who don’t add value to your brand. Once, you’ve created a shortlist of influencers; the next step is to approach them. Make sure to use our tried-and-tested email templates to help you reach out to potential influencers. With that said, finding the right influencer for your brand can be a major challenge. 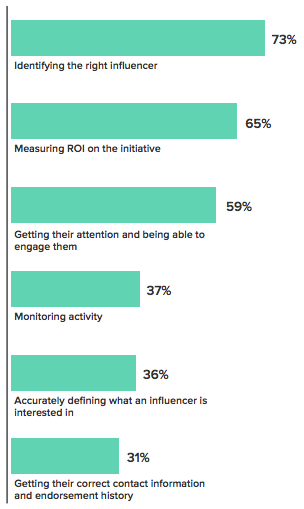 In fact, according to a survey by Econsultancy, 73% of digital marketers responded that finding the right influencer is the biggest challenge of influencer marketing. Do they belong to your brand’s niche? Does the influencer like your brand or products? Have they spoken about your brand previously? Does their personality match that of your brand? Does their creative style suit your brand’s persona? Are the influencer’s subscribers your potential/target customers? Finding the answers to these questions will help you narrow down your search. Spend some time and resources to locate the right influencers for your brand. It’s worth it. Many influencers are active on various platforms – from the most popular ones like Instagram to more obscure ones like LinkedIn and Quora. Very often, when businesses think of influencer marketing for ecommerce, they consider only the big names like Facebook, Twitter, and Instagram. But other, less popular platforms like blogs can sometimes give you better results. So, how do you find the right platform for your influencer marketing campaigns? If your target audience is likely to be on Instagram (you can find this based on buyer personas), then it makes sense to focus on popular Instagrammers for your influencer marketing campaigns. If they are more active on another platform, you should start there. Industries like beauty and baking, for example, are more popular on YouTube than Facebook. You also need to choose the platforms that make the most sense for your product. For example, if you sell kitchen gadgets, then YouTube is the ideal choice for your brand. This is because you can showcase your products in action using YouTube videos. Yes, Instagram too allows videos, but the videos aren’t long enough, and your product wouldn’t make much of an impact if you use only Instagram. The platform you use for your influencer marketing campaigns matter as much as your choice of influencers. This one should go without saying. You need to ensure that the product you’re promoting fits the lifestyle of the influencer. This is what makes the campaign authentic, credible, and organic. Let’s illustrate this with an example. Fitbit nails this tactic perfectly by partnering with influencers who are a perfect match for the brand. Check out the post below, from FitBit in partnership with Blake Raymond, one of the top fitness instructors in LA. Take a look at the Instagram profile page of Blake Raymond. Partnering with Blake Raymond is a smart move for FitBit, as Blake’s followers are likely to be interested in fitness and a healthy lifestyle. Also, the product doesn’t feel out of place with Blake’s lifestyle because he is a fitness instructor. Make your influencer marketing campaigns feel authentic by matching the right influencers with the right products. Finally, you need the right tools in your arsenal to make your influencer marketing campaigns a success and to boost ecommerce conversion rates. An influencer CRM tool like that from Grin can help you manage all aspects of your campaign like finding the right influencers, measuring influencer outreach, measuring the success of the campaign, real-time analytics, KPI reports, and more. The best part is that these tools are easy to use and come with a user-friendly interface. Gain an edge over your competitors and up your game with the help of the right tools. We live in a world of social media, and influencers are digital word-of-mouth ambassadors. When done right, influencer marketing is one of the most powerful ways to boost the sales of your ecommerce store. If you haven’t started with influencer marketing yet, then why wait? Give it a shot now. Are you looking to get started influencer marketing? Or do you have experience with it? Share your influencer marketing success stories (and even your fails) with us in the comments below and let’s get the conversations started! Before you leave, don’t forget to download our free guide on optimizing your ecommerce website for influencer marketing.